Janakpur, March 24 : The Chaite Chhat concluded today with the offering made to the rising Sun. Those observing a fast visited historical ponds like Ganga Sagar and Argajal to make the offering to the Sun including specially made delicacies, fruits and agro produce. 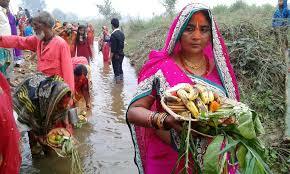 Women take the lead during this festival, with a resolution for the interest of the society and family.